Well, it's that time of the year again, when the weather cools down enough to have a bunch of friends comfortably sit around a table for dinner without the need to sweat in the heat. So it came to pass that Dario, Susie, Lisa and Joe came over bearing gifts of wine and chocolate while I slaved away in the kitchen. Lisa kept saying that I made it look so easy, which gave me my long awaited opportunity to emulate Curtis Stone and proclaim: "here's what I prepared earlier!" The trick is the two hours of prep in the morning, and the 3 hours of prep and cooking just before my guests turned up. And not to mention a couple hours of shopping in between, and I even managed to squeeze in a cheeky cigar and JB (no not Jim, but Johnny) with the boys at Devlins in the arvo. 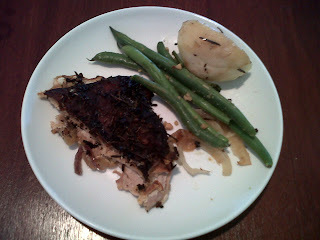 The main course was a recipe I picked up on taste.com.au. The recipe was for Tuscan-style roast pork belly, but being unable to find fennell seeds, I decided to add an Oriental-Indian fusion to the recipe, swapping out the fennell seeds with cardamon pods and coriander seeds. And instead of just letting the initial 500ml of wine dry up in the roasting pan, I topped it up with chicken stock every half hour or so when the liquid looked like it was going to dry up (not a lot baby girl just a little bit, as Fifty Cent says). So the meat effectively gets braised while the skin stays dry and crackly. Both Joe and Lisa remarked that they didn't normally enjoy eating pork, but the meat was so tender and juicy that they (and the rest of us) had seconds. Sadly, I forgot to take a picture of my masterpiece, but here's a plate of the leftovers. Potatoes were boiled for about twenty minutes until they were soft but not squishy, then halved and slathered with duck fat before going into the roasting pan with the pig half an hour before the end. Long beans were easy - quick blanch in the still hot water from boiling the potatoes, simmer some garlic in a generous dollop of olive oil in a pan on medium-low heat, then stir fry the beans through until thoroughly combined and starting to sizzle. Add cut chilli for extra spice. For drinks, we started with a 1999 Delamotte Brut, from Mesnil-sur-Oger, the little brother to the legendary Salon Le Mesnil Blanc de Blancs (which compared to the commercially known rapper's champagne brands is like comparing a Barrett to a Marlin). Highly underrated because it's relatively unknown, it is a champagne of amazing balance, delicious citrus mouthfeel, but so soft it slips easily down your throat like velvet. Then we have Dario's contribution, the 1997 Brunesco Di San Lorenzo by David Migliorini. Again underrated and not so well known, but this Tuscan sangiovese still had backbone14 years after coming off the vines, and was a perfect foil to the pork belly - slightly sweet plummy juicy flavours with a dry-ish finish. And a little tip on sparkling water - nobody I know can tell the difference between Coles brand and the imported Italian stuff. So instead of spending 3 times as much on your sparkling water, just pour and serve in a nice glass carafe! As my forays into dessert-making have always ended in disaster, I opted instead for a plattter of Rocquefort, piquant, moist yet crumbly and La Bouche D'Affinois, super creamy, runny and almost syrupy; with a bunch of seedless grapes and crispbread. Perfect with the delicious Woodlands Estate V.P. - a port with a surprising twist - it's much lighter than your usual port, yet still sweet and flavoursome without the gout-inducing unctuousness of most ports. Lisa was so impressed that she toyed with the idea of buying a bunch as gifts - yes please do, Lisa - we need to support West Australian, especially where it's so well-deserved. Speaking of great West Australian wine, the mood was so convival that Dario and I cracked open my last bottle of 1985 Moss Wood Pinot Noir. 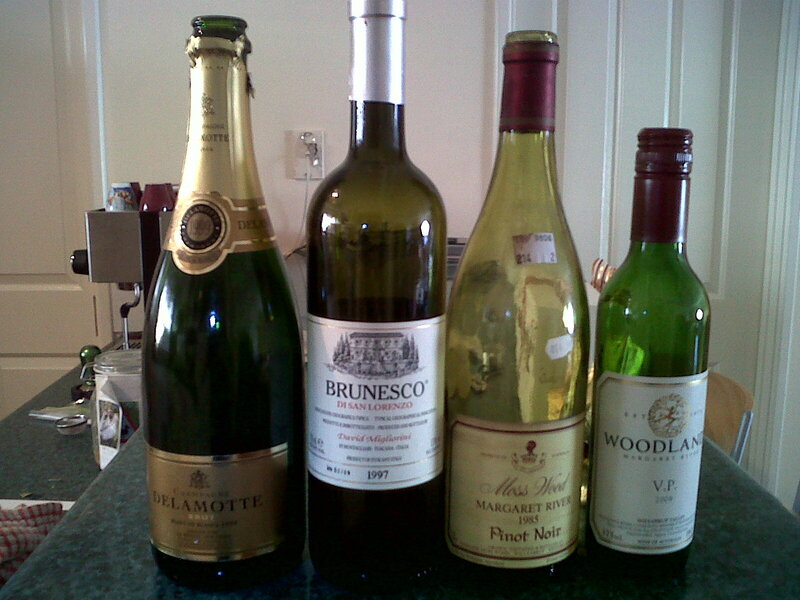 The cork had slipped down into the neck, so I was quite worried. But with a bit of finagling with my invaluable twin-pronged butler's friend, I managed to get it out intact and decanted the wine. After a bit of breathing to blow off the head of sulphur, this wine was amazingly drinkable - very mellow and almost fruity but still displaying strong tannins. Dario and I then adjourned to the cigarden (sorry Simon for appropriating your term) for an after-dinner cigar - a Por Larranaga Petit Robusto, with its medium bodied choclatey flavours offset against a glass of Martell Cordon Bleu, for a good bloke-to-bloke chat about life, the universe and everything. As Arthur Dent discovered, we all know the answer, but working out the question is the real issue. Thank you, guys, for a most enjoyable evening of friendship and relaxation, and a start to what I hope will be the Frenchman's 2011 dinner party series, as the weather slowly turns colder in this part of the world. Pork belly - Angelo Street Gourmet Butcher in South Perth - they'll cut it to order and even de-bone it for you. Thanks for dropping a note, Carmy! When Jamie and Sarah are back in July, I'll have to get you guys over (and Tez, Fi, Chloe and Dan too) to try the pork belly and tell my what you think! Kids welcome too, of course.